Highlighted by wood legs, this transitional loveseat makes a perfect addition to your modern living space. 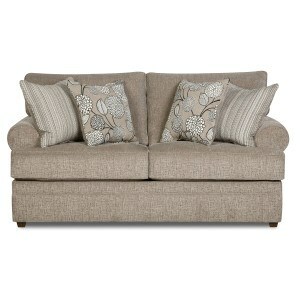 Showcasing rolled arms, this loveseat features supportive seat and back cushions. Able to accommodate two people, this loveseat presents extended comfort for your home. The 8530 BR Transitional Loveseat with Rolled Arms by United Furniture Industries at Miskelly Furniture in the Jackson, Pearl, Madison, Ridgeland, Flowood Mississippi area. Product availability may vary. Contact us for the most current availability on this product.